Origin: Western and Eastern Indian Ocean, Western Central pacific Southeast Atlantic. 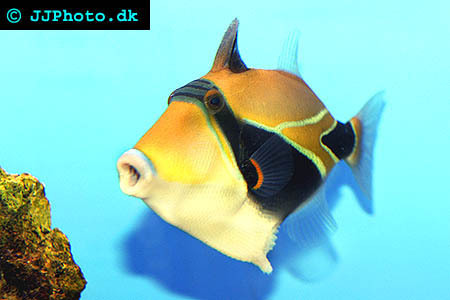 Company: Rhinecanthus rectangulus (Wedge-tail triggerfish) should ideally be kept with organisms that can be found in the fish’s natural environment. Aquarium Setup: Rhinecanthus rectangulus (Wedge-tail triggerfish) are curious and intelligent, and you need to give your Wedge-tail triggerfish a home with plenty of things to explore such as of rocks, caves, and other décor. It needs small places to hide in as well. This species like to re-arrang, so heavy objects must be stacked well to avoid damage to the tank and the fish. Water temperatures should be in the high 70’s, pH between 8.2 and 8.4 and the water clean and well filtered. Food: Rhinecanthus rectangulus (Wedge-tail triggerfish) eats crustaceans, worms, fishes, sponges, algae, detritus, foraminiferans, echinoderms, molluscs and eggs in the wild. You can feed your fish a variety of things; such as cut fish fillet, shrimps and clams. 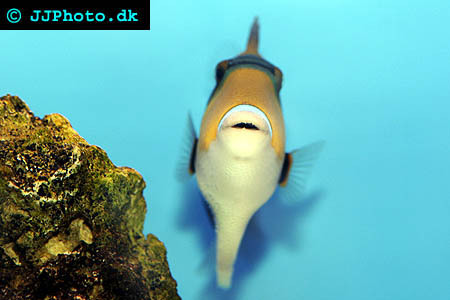 Breeding: We have no information about how to breed Rhinecanthus rectangulus (Wedge-tail triggerfish) in aquariums.